This song was written by Gopala Govinda Mahanta, an admirer and follower of Srila Bhaktisiddhanta Sarasvati Thakura. This song passed the scrutiny of all of Sarasvati Thakura’s initiated disciples. We know that Srila Sridhara Maharaja appreciated this song very much and he would always have it sung on the day of Srila Sarasvati Thakura’s disappearance. Gopala Govinda Mahanta was not an initiated disciple of Sarasvati Thakura. Generally we put so much emphasis on proper initiation in order to become a proper disciple and properly understand Krsna consciousness. But what is initiation? There have been many people who have taken initiation from the beginning of time till now, who later became the enemy of their guru. Simply taking initiation does not mean anything. Yet it is a formality that is kept intact because if we remove the form, then anything goes – there has to be some form. Srila Sarasvati Thakura emphasized that we are the followers of substance, not form. However, we have to give it some form, otherwise how will we find the substance? There has to be some organization, and therein lies a problem – giving form to the substance of God consciousness and thus allowing people to connect, and simply becoming an institution in the material world which is all about form and nothing about substance. Therein lies the problem. This world is a problem! It is not a nice place. Yesterday afternoon I was looking at the river here. It was so beautiful. But as I looked down I saw a big fish come up and eat ten other smaller fish. Then there was a crab that was crawling around trying to pinch everything in sight. So even within beauty, if you go a little further, you will see that there is only suffering, destruction and death. Presently we are making a beautiful ghata by massacring all the shellfish that are around there cutting our feet. We’re chopping them, smashing them, eliminating their existence. That is this material world – a place of elimination. When you minimize the dangers in your proximity then that is considered to be nice. There actually isn’t anything nice. We say, “It’s a beautiful sunny day”, but actually the sun is killing people – it’s giving people skin cancer; it’s causing the algae to grow in the water. At the same time, if we don’t have any sun, we’d die. He said, “No, no – that is not a word in a Gaudiya Vaisnava’s vocabulary”. Sometimes I’ve seen amongst devotees saying goodbye to each other and they say, “Enjoy your trip to Vrndavana.” It’s not about enjoyment. So, as we were saying, generally much emphasis is given to initiation, but when it comes down to it, what is initiation? Is it just a ceremony? Is it just receiving some beads that cost a few rupees in the market? Is it receiving some mantras and then writing them on a piece of paper and memorizing them? Is it receiving a sacred thread that is also purchased in the market? Is it offering grains into the fire that is said to be the mouth of Visnu? What is it? Initiation is actually a heart connection. It’s also described as knowledge of one’s eternal relationship with Krsna that constitutes initiation. Many people have knowledge, but knowledge can be very theoretical. But when there’s a heart connection, when it’s deep within the plane of faith (sraddha), then that connection is made and that is initiation. It is possible to make that connection without going through all the required ritualistic steps. For example, anyone can chant the Maha-mantra. Still it is recommended that one should take shelter of a bona-fide guru and learn the process of devotional service. If you go back to ancient times, we see that Sukadeva Gosvami didn’t take initiation. When he was born, he immediately ran away from home and went to live in the forest. Vyasadeva wanted to instruct him, so he sent out his disciples to collect wood and instructed them to chant a verse from the Bhagavatam. Vyasadeva knew that if Sukadeva would hear this, he would become attracted. When Sukadeva heard that verse he came out of his conscious equilibrium of being unconcerned about the world and asked the disciples, “Where did you get this sloka?” The disciples directed him to Vyasa’s asrama, and there he heard the Srimad Bhagavatam. However he did not undergo the rituals of diksa. So in the ancient world things were predominantly based on substance. Initiation meant receiving the mantra, and receiving instruction from the guru – there was no ritual. Lord Brahma was initiated by Krsna – they didn’t sit down and perform a yajna or any type of ritual. But these things developed in time because we’re not Lord Brahma or Sukadeva Gosvami. Therefore, personalities of the class of Sukadeva and Brahma developed a system because people in this world require such. Particularly in this age institutions are unavoidable. There are institutions and organizations for everything. The Deist movement in America that is credited as being the religion of the founding fathers was not based upon Christianity at all. In fact, most of the founding fathers could not stand Christianity. They thought it was a foolish idea that was detrimental to human society and they are the ones credited with the most enlightened political doctrine that is called the American constitution. But the Deists didn’t have any institution. They didn’t have any churches, they didn’t have any meeting hall, and they had no official name. They didn’t do any preaching, they didn’t have any coded book. They had some letters by Thomas Paine that inspired them, but it wasn’t a scriptural canon. Eventually they vanished. Christianity was building churches everywhere. You go to some countries and there’s a church on every corner. Even within half a mile of the Vatican there’s twenty more churches. They’ve got them on the corner of every single ancient city. That was their mood – the more churches, the better. People go to churches, so open more churches – make an institution. The Deists had nothing so they were almost forgotten. So there has to be some rules and institutionalization in this world, there has to be some buildings. One friend of mine, when he started preaching he said, “Temples are not important. First just make a temple in your heart”. But then when he got a lot of money he started opening temples. First he was criticizing Prabhupada and ISKCON for opening many temples, but then when he got money and a lot of followers he also started building temples. If you have a message, you have to have an institution that people can come to. But simply joining that institution and simply going through all the rituals does not constitute real initiation. Real initiation is born from sraddha. What is the first and last word of the Absolute? When you chant the maha-mantra, the first word is ‘Hare’ and the last word is ‘Hare’. That is the first and last word of the Absolute. What is Hare? Hare means Radharani. She is the internal potency of Krsna, and where you find that first is in sraddha. She is Sraddha-devi. The effulgence of Radha is sraddha. That comes and shines on the living entity. Our journey to the Absolute begins with faith, and it ends with service to Radharani. There are many types of service – serving Lord Narayana, serving Lord Narasimha, serving Lord Rama, serving Lord Krsna in Dvaraka or Mathura and serving Lord Krsna in Vrndavana in various rasas and this finally comes to the highest type of service. Krsna is Vrajesvara, but Radha is Vrajesvari, the feminine controller who controls Krsna by Her love, devotion and surrender – then Krsna Himself becomes a servant of Radharani. The first and last word of the Absolute truth is Hare – faith in the beginning, and divine service in Goloka in the end. Everything else is there to help us find where that faith is. Faith is the fundamental basis, and faith changes and takes different shapes. It is called nistha, it is called bhava and it is called prema. There are nine stages that faith goes through. Faith itself becomes prema – pure love of Krsna. That has many shades and varieties also. All these things have to do with capturing the plane of our heart – not the brain. Calculation can be our enemy, and the brain can be a dangerous and fickle sense. The brain means the mind. Once I was talking with a man at a university who said, “I’ve realized the truth”, and he pointed to his head. And I replied, “I’ve realized what is meant to be true”, and I touched my heart. Bhakti is not in the head, bhakti is in the heart. But that doesn't mean this material organ that pumps blood – otherwise when the heart dies, then bhakti also dies. Intuitively, when we speak of the self, we point to the heart. We intuitively know that the self is there. Even an animal has certain intuitions. There are many God-given intuitions. However, as human beings, we sometimes have less sense than animals. When an animal sees something hurts him, he stays away from it. But human beings create machines that kill them, cigarettes, junk food etc. You’d think they would change their lifestyle, but no! Even if it’s killing them they don’t stop. But when an animal is suffering, it analyses why and stops. So on some level, human beings are dumber than animals, because they can’t give up the cause of their suffering. In science we understand that there are reactions to certain experiments. If you boil water, this happens; if you add this chemical, that happens etc. But then on the physical plane, do they really think that they can do anything to anybody and nothing will happen? That means they are less intelligent. They can’t figure out what is actually the cause of their suffering. Recently there was an article by a scientist from England and she begins by saying that for centuries modern science and Christianity have banged heads. When Christianity was developing they didn’t know about the universe, they didn’t know the order of the planets, they didn’t know that the world was round etc. Then science came along and discovered all these things and found out that what the Bible said and what the church said wasn’t true. The scientists then said that religion was invented simply because people didn’t understand the world around them. This lady points out that that idea falls flat on its face when you come to ancient India because at the time that the Vedas were written, there was great scientific knowledge. In fact it is written in the Vedic literature that the world is not flat, that there’s the order of the planets, that there’s a thing called an atom etc. So the argument that God was created out of necessity because mankind did not understand the universe doesn’t work when you look at Vedic civilization because they knew all these things and still they concluded that, “God did it”. Some people say that science and religion cannot be harmonized in any way, but that’s also wrong. All this scientific knowledge was there in Vedic times – in fact, some of the greatest scientists in the ancient world were great spiritualists also. Actually science is born out of real religion, and therein lies the issue – science in general has never examined real religion. They have only examined the concocted religions in the western world. They have never closely examined the body of Vedic knowledge. You will find that some of them have, but with a biased viewpoint - they don’t like the color of the people who wrote the Vedas, they don’t like the language of the Vedas because it kind of makes them look bad. Srila Bhaktisiddhanta Sarasvati Thakura liked this type of preaching – he liked to challenge misconceptions, be they religious, philosophical or historical. Of course, historical misconceptions are not so important, but scientific misconceptions are very important. For example, look at Darwinism - its not even knowledge, it’s an unproven idea that still rules the world. Darwinism was already on the way out during the time of Bhaktivinoda and Sarasvati Thakura, its death grip was broken, but still Darwinism is being taught in schools. The old guard dies slow, but the good news is that finally they will die and the new guard takes over and then new ideas have some scope. Young people are making a big noise about the government, the economy etc, but they don’t understand that they don’t run this world – they don’t control money until they get to about fifty years old in most cases. Those above fifty run the world. They control all the money and everybody else is simply eating biscuits. That’s the way it is, and that’s the way it’s always been. Actually, the truth is America doesn’t even control it’s own money – the European Bank does. Other organizations control the so-called wealth of America. It’s the economic plan. Prabhupada was also planning – he was walking up and down the room thinking how to take over the world. Many times he’d ring his bell and his secretary would come in, thinking he needs something. Then Prabhupada would say, “Books for the intelligent, prasadam for the masses – this is what we have to do”. He was not just sitting in his room thinking about some small thing. He was thinking about how to take over the world. In the material sense there are many people trying to control the world, and from a religious sense also there are many people that want to control the world. Nowadays there are some people who want to control India and convert India to Christianity. There was a recent e-book I saw online written by some Christians who want to convert India to Christianity. The book was called ‘Exposition of Damnable Heresies” – that kind of title belongs somewhere in the 1700’s. The next thing to follow that is witch burning. This is the sort of book that they used to shake in peoples faces before burning them alive. Let these people loose and they would do it again. They would light everybody who’s not a believer on fire. They have an office – it used to be called ‘The Congregation of the Holy Office of the Inquisition’, Now it’s called ‘The Congregation for the Doctrine of the Faith’. They adjusted the sound of the name, but the business is the same. Sometimes it disturbs me how devotees become so smalltime in their thinking. Sometimes they say, “Well, what about me? What about my life?” I tell them, “You don’t have a life. You’re just dying, and then the day comes when it’s finished. What do you mean, ‘your life?’ Did you prescribe to be born somewhere, a certain size, a certain color? Did you prescribe for this? Did you even request it? You had nothing to say about it! So where do you get this idea of ‘my life’? What part of it is yours? You don’t know how many hairs are on your head, you don’t even know what your skullcap looks like, but you say, ‘I want to lead my life’. One friend of mine left Krsna consciousness on the plea that, “Well, I never really had a relationship.” Fifty million lifetimes of buzzwords like ‘relationship’… what are you talking about? It is simply something going on in the material mind. Your life belongs to Krsna. We’re just riding on a chariot that doesn’t even belong to us. If you want to qualify that then become a devotee of Krsna – then your life belongs to Krsna. Devote your life to Krsna – that’s living your life properly. What is this thing about ‘fulfilling a relationship’? Who? Where? Show me! There is no fulfillment in the material world. In the end there’s only disappointment. Then you will surround yourself with photographs and trinkets, trying to convince yourself that you’re fulfilled. When you’re dead and gone, they will tie them all up and throw them in a box. Did you ever see all those black and white photos from the turn of the century and World War II? Those were somebody’s dear photos and now they’re just in an antique shop somewhere gathering dust. Nobody knows who those people were. And even if you do make your mark and do something great in this world, they’ll probably write something about you in the history books that is wrong. You could be the next Tesla, but it’ll be a hundred years later before we find out what you actually did. You could be a jerk and go in the history books as a wonderful person, or you could be a wonderful person and go down in history as a jerk! And how long will your name be famous? There are names like Pythagoras and Plato from the ancient world, but how many hundreds and millions of people have come and gone since then? What is your real prospect? What is your life all about? What matters? Devotees are not supposed to be like the everyday Joe in this world with a mundane job. That’s not what Krsna wants. Krsna wants a revolution! He doesn’t necessarily call for a violent revolution, but He wants a revolution of consciousness. When you have a revolution of consciousness that means a change of lifestyle. This thing where devotees try to live the American dream and settle down in middle class America in row housing with a two-car garage has nothing to do with why they came to Krsna consciousness. They should just give it up! One acarya has said, “I’m selling my house and moving to Vrndavana.” Then in the next verse he says, “If nobody wants to buy my house, then I’m just going to give it away’. The point is that there are better things. If you can’t cash out, then give it away, burn it, throw it away – who cares? Srila Sridhara Maharaja says, “Get out of the fire of the thing that charms you and keeps you in the fire, whatever it is.” There is nothing more important than Krsna Consciousness. Unfortunately most living entities never realize this. Hundreds of billions of people are dying every day and they don’t realize the real purpose of life, they just float through. They accept some good times, some bad times, and just move on – not upwards. They’d be lucky to simply attain a second human life – and that’s almost impossible. This is not the India of Satya-yuga where people are going to heaven or to Vaikuntha. This is the India where 2.4 million people are dying of AIDS and going to hell. What is the meaning of going to hell? It means that they’re not getting a good, prosperous, wholesome birth in their next life. Practically everyone in India believes in reincarnation. But they just think that they’re going to be a human in their next life. They don’t think, “What about all the dogs? Where did they come from? What about all the fish? Where did they come from?” They just think, “I have many lives, next life I’ll be born in this village.” Well, maybe... as a crow or a goat! Even that is doubtful. They’re not really seeing what he’s seeing. It would be like coming to the temple and seeing Krsna Himself sitting on the altar eating, and after seeing that, you said, “Well, I’ve got to go now. I have to get back to work.” Who would do that? If you saw that, you couldn’t go back to work anymore. If you realize Krsna, you won’t do that anymore, unless that is what Krsna wants you to do. Kunja-bihari was the secretary of the Gaudiya Matha. He had a job and gave all his money to the mission of Sarasvati Thakura. And whenever he could take a loan, he took a loan and he also gave that. He’s already giving his salary, so how is he going to pay back the loan? Usually if you take a loan you have to keep some of your salary to pay the loan; but he took all the salary and gave it. Eventually he left and went to work in Basra in Iraq where he got a higher paying job so that he could pay back the loans that he took. Finally Sarasvati Thakura contacted him and he came back. Nobody tells if he paid back the loans because that’s irrelevant. What we’re told is he gave everything in the service to his guru. Professor Nisikant Sanyal was another disciple of Sarasvati Thakura who was also like that. He worked as a professor at Cuttack University. He would get his monthly salary from the university and he would give everything to his guru – everything! And then Sarasvati Thakura would give half back to Professor Sanyal’s wife and say, “This is for your matha”. ‘Matha’ means their household. Now, Prabhupada didn’t do that, and most of his disciples didn’t do that. They didn't just come and give everything. But everyone has to face this reality – if what we’re doing is not benefitting Krsna Consciousness, if it’s not in the association of devotees then it’s just a waste of time. That’s the real vision of life. Even people with big institutions decide what they’re doing only based on their institution – they don’t do things for the benefit of others. But if those others are going to join their institution then “of course we can do that”. But if it’s just for the broad benefit of others then, “No, we don’t want to do that. We can’t help others.” This is not Krsna’s vision. Krsna’s vision is much broader than the institution. Once, Srila Prabhupada said, “Bring five hundred children for the gurukula.” Then one devotee said, “But Prabhupada, we don’t have five hundred children in ISKCON.” Prabhupada said, “ISKCON, Schmishcon! Just bring children!” He didn’t care if they were ISKCON children or not – bring children into the school and give them a proper training. Of course, that was the ideal – in the end it became something different. 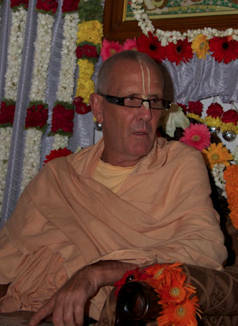 But it wasn’t that Prabhupada was thinking, “It has to be our ISKCON children. 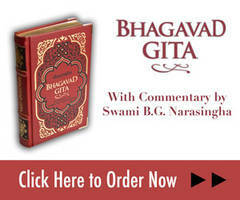 The children have to sign up and be in ISKCON first.” It was, “Let us train children. Let us train people.” It wasn’t just for one group – it was for the world. It was not that he was creating a little clique that was for itself and by itself. No – this is for Krsna, and in order to be for Krsna you have to be attentive to the will of Krsna. When you’re inattentive to Krsna’s will, you miss an opportunity. Many spiritual institutions evolve into a scenario of missed opportunities that ultimately becomes their total lifestyle.